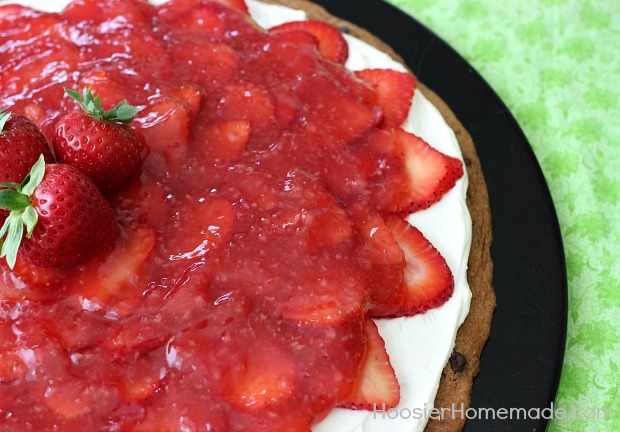 Chocolate Chip Cookie Crust topped with a layer of Cream Cheese mixture, fresh Strawberries and Strawberry Glaze – perfect for any occasion! My parents loved their yard and garden. There wasn’t a day that went by, unless we were knee deep in snow, that you wouldn’t find them outside in the yard. My Dad was very proud of his yard, he and my Mom worked tireless hours on it to make it beautiful for all to enjoy. One of my Dad’s prize winning gardens was his Strawberry Patch. I remember him on his hands and knees for hours at a time cleaning out the berries, and picking bowls full for my Mom to use in her cooking. Unfortunately, those days have past, so until my strawberry patch begins to produce more than a handful of plump, juicy, flavorful berries, I will need to rely on Driscoll’s for my Strawberries. Years ago I made Fruit Pizzas quite often, but this time around when OXO and Driscoll’s asked me to share a recipe with you I decided to change it up a bit. 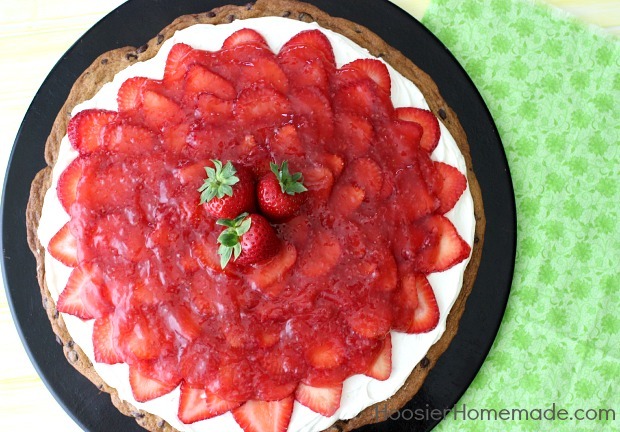 The first thing that popped into my head was a Strawberry Pizza, but it couldn’t be just a normal recipe for Dessert Pizza, it needed Chocolate. Enter the Chocolate Chip Cookie Crust – as simple as refrigerated cookie dough, spread onto a baking stone. 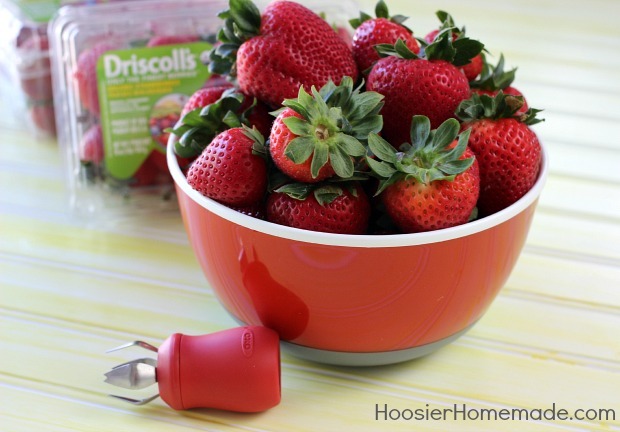 In four super easy steps, that take about 3 seconds or so, your strawberry is cleaned and hulled perfectly. 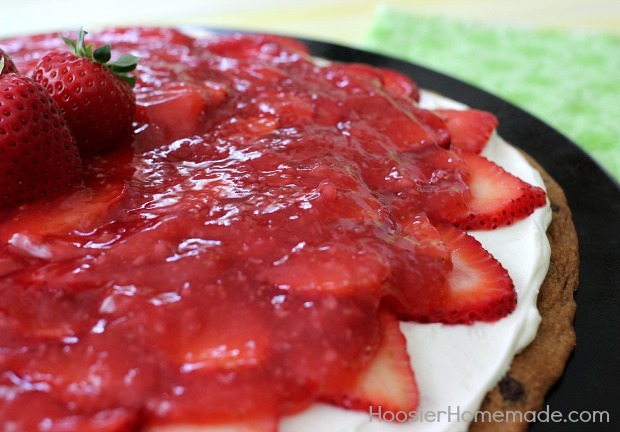 If you have ever cleaned even a quart of strawberries with a knife, you will totally understand how great this Strawberry Huller is. I bet my Mom would have loved one of these gadgets when she was cleaning pounds and pounds of strawberries. See how nice and even the Strawberries are sliced? We used our new Egg Slicer for that, yes the same one that you make Egg Salad with, and it worked like a dream! I’m joined today by 14 other bloggers who are celebrating #TheIncredibleHull and Strawberry Huller. 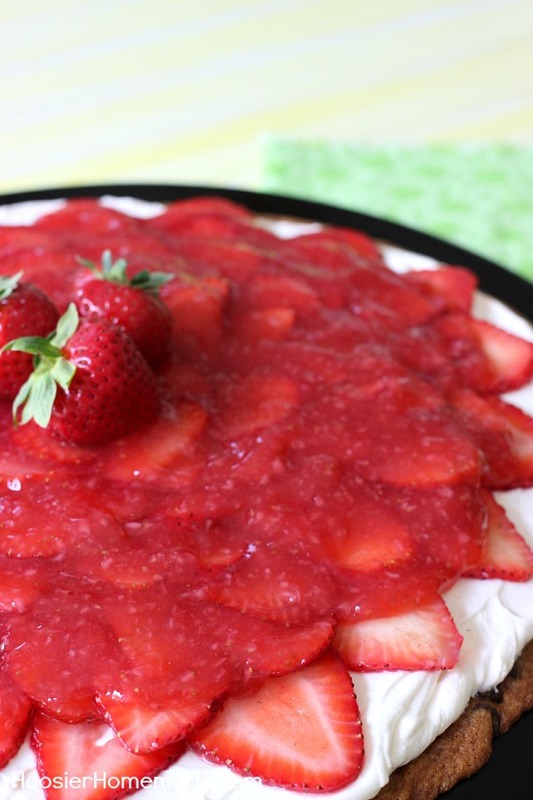 Visit them for more amazing Strawberry Recipes! If strawberries are not smooth, you can either put them through a sieve and smash them or use the food processor. Will this hold up overnight to take to a picinic? Or can I make everything put in fridge then assemble before I go? Hi Elisia, yes you will need to make the layers and assemble them before serving. A few hours is fine, but the crust will get soggy. 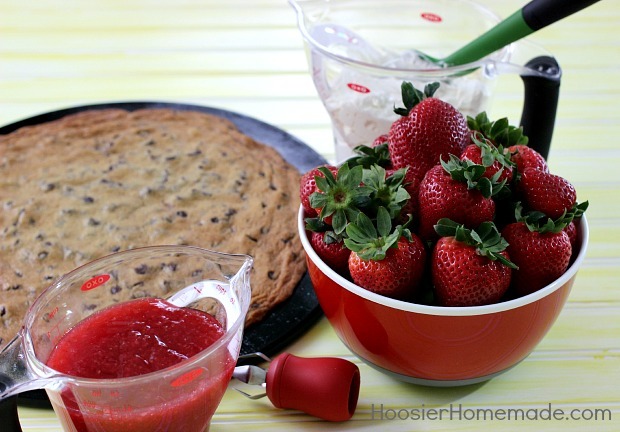 Yes, how did you make the strawberry sauce and the cream cheese mixture? Am I missing the recipe for the white layer and the strawberry glaze/sauce? It looks delicious!! Hi Jen, it’s under “filling for pizza” spot, the cream cheese, whipped topping, vanilla and powdered sugar part. 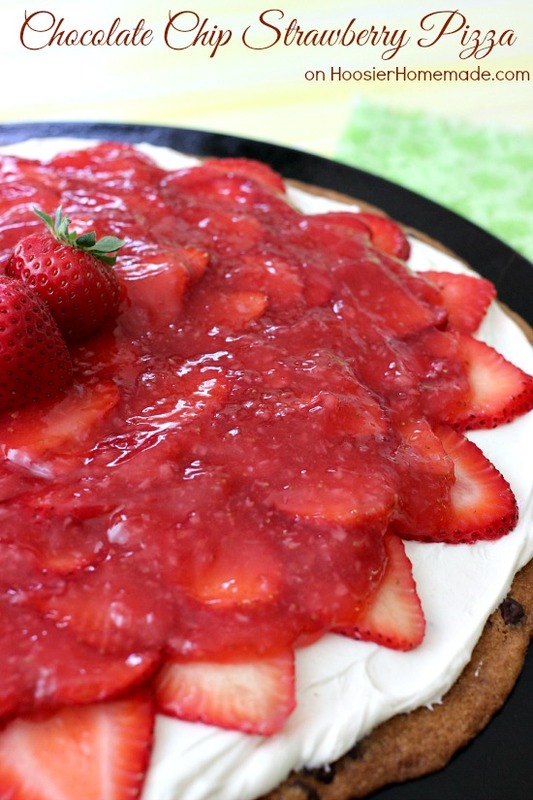 How did you make the strawberry sauce and the white-colored layer?